﻿﻿﻿Don’t be afraid to use grandma’s pans — just treat them right. ﻿﻿﻿There’s nothing better than food cooked outdoors over a fire, especially when there’s a chill in the air. For the best results, use cast iron pots and pans. They can take the heat and impart even more flavor. The cast iron pot is a traditional cooking pot that has a natural nonstick surface commonly referred to as “seasoned.” Today’s manufacturers sell cast iron pots and pans that are seasoned during the production process. Gone are the days of having to season a pot at home before cooking with it. ﻿Cast iron pans, great for cooking outdoors or indoors, have natural nonstick surfaces. If you care for them correctly, they’ll last a lifetime. What is great about cast iron is that the nonstick surface is very forgiving when it is seasoned properly. Cast iron is easy to clean (and even fix) when a pot shows signs of rust or an uneven patina, unlike modern nonstick pans that cannot be repaired when damaged. Clean cast iron with hot water and a dishcloth. For that difficult sticky stuff that will not come off with a cloth, use a scrubbing pad with light pressure. When food particles have been removed, rinse the pan and place it on the stove over low heat to dry. Once it’s dry, rub the inside of the pan with a light coat of vegetable oil and then heat the pan over medium heat until the oil shines. Remove the pan from the heat, allowing it to cool before putting it away. Because the layers of carbon are porous, do not use any detergent when cleaning cast iron. Detergent will find its way into the carbon layers; the next time the pot is used, there may be a faint taste of soap in the food. To repair a damaged cast iron pot, use a strong abrasive, like a stainless steel scratch pad. Remove the rust or damaged patina and dry the pot. Coat it with a light coat of vegetable oil and place it in a 350-degree oven for 30 minutes. Do not use an animal fat, like bacon grease, because it may become rancid. After 30 minutes, turn off the oven and let the pot cool. This will season the pot and start a new layer of carbon. The first few times the re-seasoned pot is used, cook items with low acidity to help build a strong patina. 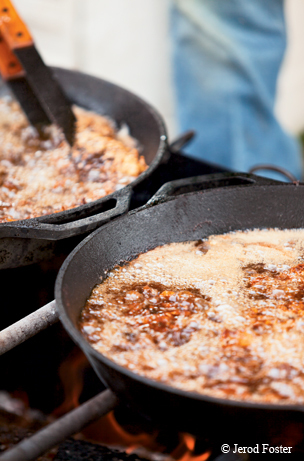 Cast iron adds flavor to your meal and has a rich history for the home cook. Next time you see an old pot hanging on a peg at a yard sale, go ahead and give it a chance to shine again. You will not be disappointed. Here is a great little recipe we call Aunt Winnie’s Camp Cake. Try it at home in the oven with your cast iron skillet or on a campout with your Dutch oven. Melt the butter in the pan, then add drained fruit. Mix ingredients and pour in the pan. Bake at 350 degrees for 30 to 35 minutes.